The Caucasian Eagle is one of the mythical creatures to appear in the legendary tales of Ancient Greece. Gigantic in stature, the Caucasian Eagle is famous for its role in punishing the Titan Prometheus. The eagle was an important symbol within Greek mythology, for it was the sacred creature of Zeus, and the supreme deity of the Greek mythology was known to transform into one, when he abducted Aegina for example, and also to make use of them, with eagles known to carry the god’s thunderbolts. The Caucasian Eagle though was not a normal eagle, despite being used by Zeus, and the Caucasian Eagle had a specific name, Aetos Kaukasios; and many ancient sources, including the Theogony (Hesiod), the Bibilotheca (Pseudo-Apollodorus), Argonautica (Apollonius Rhodius), and Prometheus Bound (Aeschylus) make reference to the bird. It was normally said that the Caucasian Eagle was one of the monstrous offspring of Typhon and Echidna, making the Caucasian Eagle sibling to the likes of the Nemean Lion and Lernaean Hydra. Occasionally though, it was said that the Caucasian Eagle was a child of Tartarus and Gaia, making it a sibling to Typhon and Campe. The Caucasian Eagle though was perhaps not as monstrous as the children born to Typhon and Echidna, and possibly Tartarus and Gaia, and so an alternative theory was put forth that the Caucasian Eagle was not a living beast, but was instead an automaton constructed by the metal-working god Hephaestus. The Caucasian Eagle received its name because its range was in the Caucasus Mountains, just as the Nemean Lion was to be found in Nemea, and the Lernaean Hydra in Lerna. The Caucasian Eagle comes to prominence in Greek mythology because of the role it played in the punishment of Prometheus, a punishment meted out to the Titan by Zeus. Prometheus had been the benefactor of man following the Titanomachy, and having created mankind from clay, had imbued it with skills and abilities taken from the Olympian gods, before stealing the secret of fire from the workshop of Hephaestus. Having then taught mankind how to get the best from the sacrifices made to the gods, the anger of Zeus overflowed, resulting in punishment for the Titan. Prometheus was thus shackled to the unmovable Caucasus Mountains with unbreakable chains made by Hephaestus. ​Then, for added torture, the Caucasian Eagle would feast on the liver of Prometheus each day; for the liver of the Titan would regenerate each night. 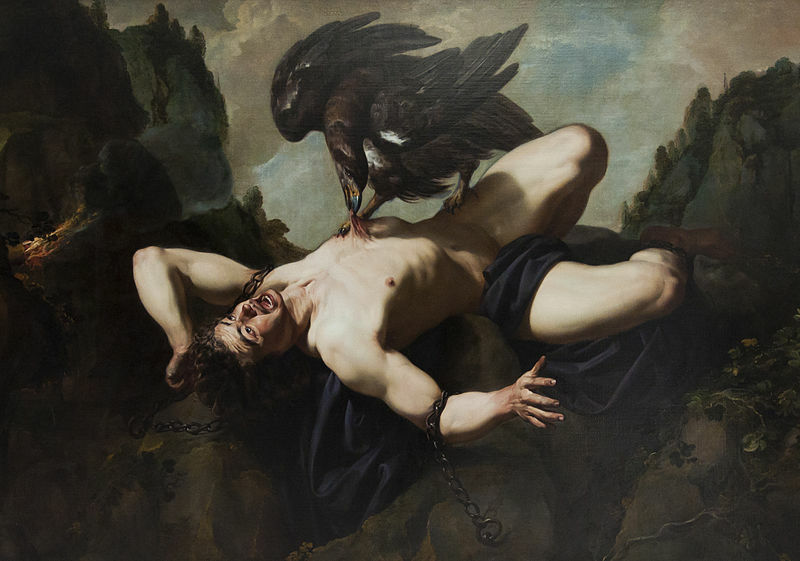 Prometheus was of course immortal, and so did not die when his liver was plucked out, but would suffer perpetual pain because of the actions of the Caucasian Eagle. The punishment of Prometheus went on for many years, and the Roman writer Hyginus, in Fabulae, put a timescale of 30,000 years on the daily feast of the Caucasian Eagle, which would indeed make the Caucasian Eagle extremely long lived. 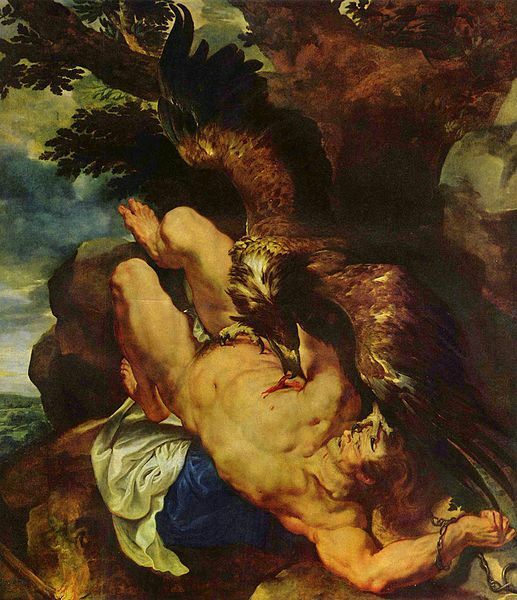 No other writer was want to put a timescale upon the punishment of Prometheus, but it was said that Prometheus was bound prior to the Deluge, for he advised his son Deucalion what to do from his place of confinement, then Prometheus was seen by Io, and the cries of pain of the Titan were heard, and the Caucasian Eagle seen, by the Argonauts generations later. The punishment of Prometheus, and the life of the Caucasian Eagle, would come to an end through the intervention of the Greek hero Heracles. 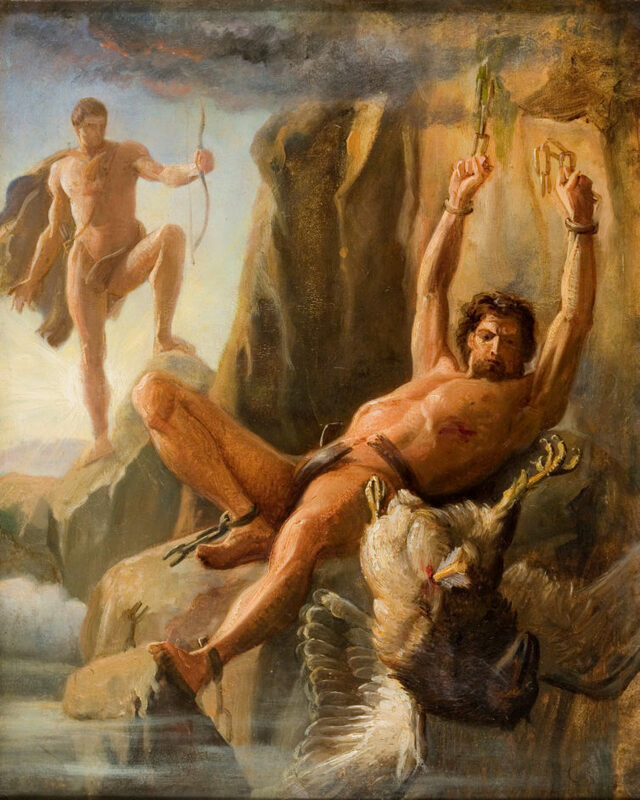 In his life, Heracles had killed many monsters, but in the case of the Caucasian Eagle, Heracles did not blindly attack the bird, and, knowing that it was acting on the instructions of his father, Heracles sought permission from Zeus to bring the punishment of Prometheus to an end. Some tell of Heracles offering Zeus the immortality of the centaur Chiron in exchange for the release of Prometheus, although it is not clear why Zeus would require the immortality of Chiron; but, in any case, whether a deal was brokered or not, Zeus agreed that Heracles could kill the Caucasian Eagle, and end the torment of Prometheus. Zeus realised that the actions of Heracles would heighten his standing amongst men and gods alike; leading ultimately to the apotheosis of his favoured mortal son. Thus, Heracles laid in wait in the Caucasus Mountains, biding his time until the gigantic Caucasian Eagle to fly overhead. Then, offering prayers up to Apollo for a straight flying projectile, Heracles unleashed a quiver fall of poison tipped arrows. Each arrow found its mark, and the Caucasian Eagle died mid-flight, crashing to the earth. The combined strength of Prometheus and Heracles was then sufficient to break the Hephaestus crafted chains holding Prometheus in place. Some tell of how Zeus would subsequently place the Caucasian Eagle amongst the stars as the constellation Aquila; although other eagles in Greek mythology were also named as the origin for this group of stars.